Currently, the iPhone is only available on two of the four major US mobile carriers: Verizon and AT&T. Yet, according to recent reports, the next iPhone will be available on both Sprint and T-Mobile as well, as confirmed by a new leaked Best Buy employee memo as well as the scheduled installation of an "Apple fixture". According to an employee memo, the iPhone 5 is expected to start taking pre-orders this month, ahead of a launch set for October 1st, although the document notes that Apple might reveal a different, yet close date when the device is finally introduced. Despite the uncertainty as far as timing, this memo is yet another evidence that the announcement of a future iPhone is imminent, which is nothing but backed up by a series of never-ending rumors and reports of an upcoming iPhone. It also seems that the iPhone 5 will indeed be available on Sprint at the same time as it reaches AT&T and Verizon. A Sprint iPhone, if it indeed does happen, will be a milestone for both the carrier and Apple itself. Up until earlier this year, the iPhone was available exclusively on one carrier, AT&T, until it became available on Verizon in January of this year, something many believed would never happen. In a matter of a few months, Apple will go from having access to one carrier to three, and perhaps even four if the device is also launched on T-Mobile. Sprint, on the other hand, would rather enjoy a reasonable boost in market share, something the carrier desperately needs. 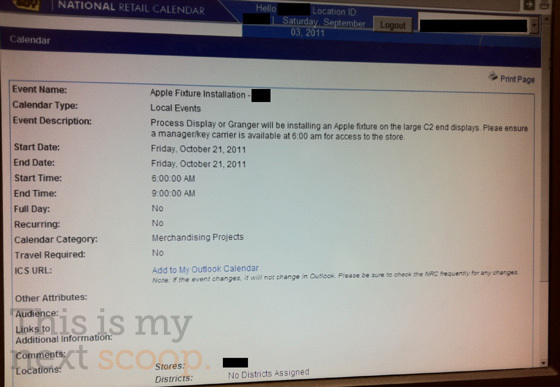 If you’re looking for more evidence, it also seems that Best Buy has scheduled an "Apple fixture installation" to take place on October 21st, as well as a meeting for all Best Buy Mobile managers on October 10th, reportedly to "discuss upcoming BIG release dates". While set for a few weeks later than October 1st, it’s almost certain that the upcoming fixture will be used to advertise the next iPhone. Rumors of a future iPhone, known as the iPhone 5, have been ongoing for several months. According to most sources, the new device will sport a larger screen, as evidenced by recent case designs; a faster dual-A5 processor, similar to the one found on the iPad 2; an enhanced 8-megapixel rear-facing camera, unlike the 5-megapixel one found on the current iPhone; as well as several possible changes, such as a thinner unibody case design. The iPhone 5 is also expected to come bundled with iOS 5, the next release of iOS which is expected to be available to the public later this month. 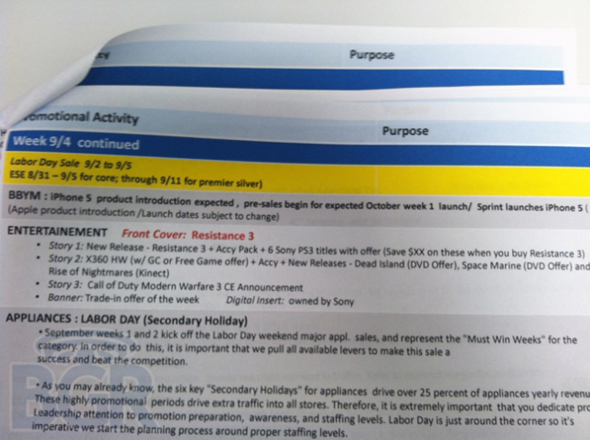 Last month, another leaked employee memo, this time directed at Sprint employees, warned them not to comment on recent rumors about the iPhone coming to the network, which only makes it more obvious that Sprint will indeed get the iPhone 5. Judging by what we know so far, the iPhone 5 will indeed be on at least three out of the four US mobile carriers as early as October. Get your wallets ready!